Clinique 3 Step SkinCare System | 3 Minute Twice A Day For Better Skin!? Skincare shouldn’t be complicated. Right product with a right amount should be enough. We all know about the vital steps of skincare; cleanse-tone-moisturize yet with Clinique it is Cleanse-exfoliate-moisturize with just three simple product that takes only 3 minutes. We all always in a quest to find the right skincare regime, aren’t we? And then the 1000 variety of products offered by varieties of brands makes us confused, we keep trying this and that and then sometimes we mostly waste a humongous amount of time/money without getting that expected result. 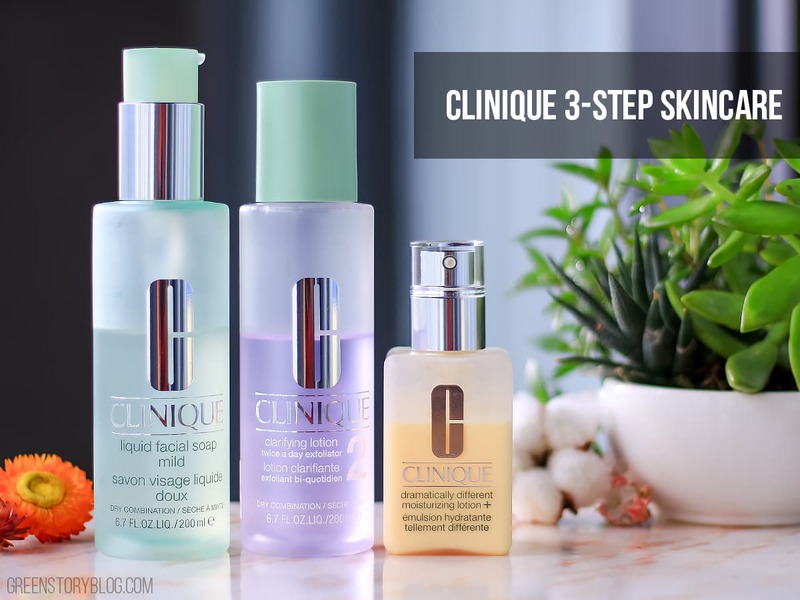 The 3-Step Skincare concept by Clinique is surely unique and effective either way. I’m glad that I finally got into the bandwagon a month ago. What is this 3-Step Skincare System? As I mentioned earlier, cleanse, exfoliate and moisturize. Clinique offers a simplified 3-step skincare system with their 3 simple product; a cleanser, an exfoliant, and a moisturizer which are curated for every skin type. In a clinique boutique, you’ll always get help to analyze your skin and choose the right system/product for you. You’re to use then twice a day, that takes only 3 minutes each session and you’ll get a clear, smooth and radiant skin with the lowest effort. In my session with a Clinique advisor, I was suggested with the 3-Step skincare system for dry-combination (I knew my skin type earlier as well) skin. After using them for a month now I’m here to share my thoughts on each of the product and how the ‘3 minute twice a day for better skin’ concept actually works. Even though it is a liquid face soap but it has just the right consistency, not as liquid as water. Glides on very easily and very much water soluble. Doesn’t later up into a foam and a perfect companion for facial cleansing brushes like Clarisonic. Easy to rinse off as well. Although this is a mild formula but it melts and cleanses every bit of dirt and oil from the face without drying out my skin. Skin feels nicely clean, fresh, oil free and comfortable after every wash. I’ll surely admit this liquid soap helps to balance out the oil on my face quite effectively. I need just two pumps for my full face and neck and it does the job. It’s been a month, using it twice a day (morning and evening) and I’m yet to reach the half way of the bottle. I find it really good for the price. Among the three product of Clinique 3-Step Skincare System, this clarifying lotion is my favorite. After washing my face with the cleanser I follow up with the clarifying lotion. I take just the generous amount (3 pours, the bottle mouth is open) in a cotton pad and the swipe all over my face and neck just once (the way I was suggested by the Clinique SA). This is actually an alcohol based (I was told the amount of alcohol is just sufficient and ‘cosmetic grade) exfoliant that helps to de-grease the skin and sweeps away dry/dulling flakes of skin. It feels cooling (probably because of containing menthol) on the skin and makes the skin ready to absorb further skincare product better. This product also feels nothing different than a regular toner to me, I honestly find it as the best toner I’ve used so far. Clinique Clarifying Lotion is fragrance-free but you’ll get the scent of alcohol once the bottle cap is opened. Some skin might get irritation because of the alcohol but my skin kinda loves it. I find my T-zone is well oil-balanced ever since I’m using this. Although my skin is dry-combination ( my T-zone is too oily, my under eye is always dehydrated) and this product is suggested for this type of skin, however, I find it a bit too much thick for my skin. After using the Clarifying Lotion, I take 2 pumps for my face and neck (as I was suggested), massage and blend into my skin. Just after the use skin feels great, non-greasy, smooth, supple and soft but after 30 minutes my T-zone starts feeling heavy. Thus, for the last couple of weeks, I’m using only one pump for my face and neck and it seems to work better as I lower the portion of the product. I love that the formula is fragrance-free (although I don’t have any problem with fragrance) and good for the dry parts of my face but next time I’m thinking to switch it to their moisturizing gel. Overall, I’m pretty impressed with the Clinique 3-Step Skincare System. It truly makes a difference as it takes less time/product for a complete skincare but keeps my skin healthy. However, as I’m in my late 20s and already got fine lines under my eyes so I couldn’t ignore using an eye cream on top of this skincare system. They are available at any clinique boutique or Sephora, nationwide. You can also purchase them online from their website. That’s why my mum like this brands so much and i should share this article to her. On last Saturday I went to Clinique counter and try on their 3 steps products. They provide the travel kits sample for me to try at home. Like their service too. Clinique was what I used before I got caught up with J Beauty and K Beauty…. huhuhu…. Clinique has been one of the early brands that I used. I wonder how much they have improved over the years. I’ve trying to use clinique products…but too bad it doesn’t work well with my sensitive skin though…. I know right, it’s the uniqueness of our skin. Not everything goes with every skin just the way I feel the moisturizer is a bit too much for me! Why have I like clinique product so much but I have never try them before… Shame on me haha… This post is very informative! Nice Review, I have never tried this product. Give them a try. Who wouldn’t love a simplified skincare specially when it works, no?! LaVieEn Rose by Loreal Paris | find your Perfect Pink in Loreal Lipstick?